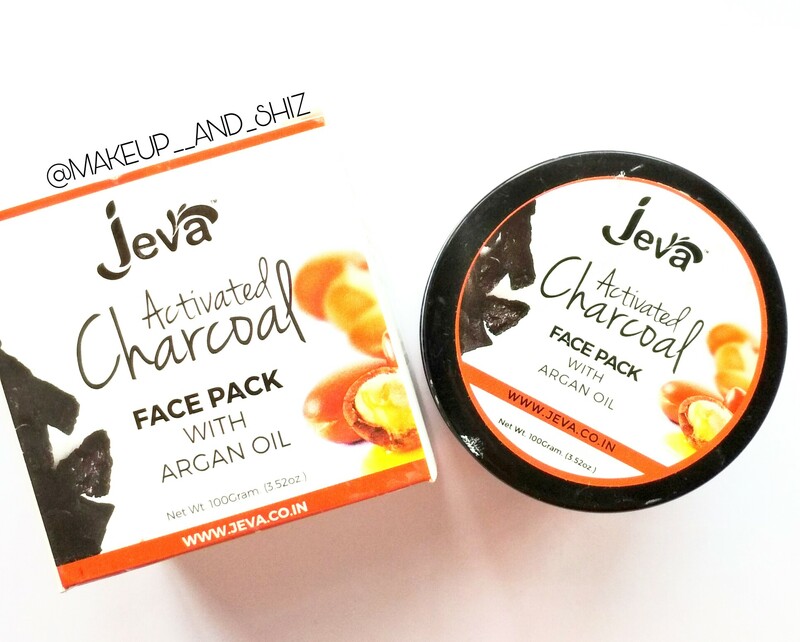 Jeva Activated Charcoal Face Pack With Argan oil – Review. Today I am gonna review the Jeva Activated Charcoal Facepack with Argan Oil. Charcoal facepack ,peel off mask are a trend these days. Activated charcoal binds to dirt and helps pull it out of pores, making them less visible . So I decided to try out this facepack from a New Brand–Jeva Beauty , that i recently discovered over Nykaa and then heard Shreya Jain talk about it . I am 23 yr old with Dry skin type. It comes in a glass tub, with everything mentioned in its body. It had a screw black lid and opening that , there is another white lid to protect the facepack. Trust me, when I first applied it on my face , my exact words were , “ It’s so buttery soft”. If you tilt your tub for 5 min or so , you can basically see the oil. Since it’s charcoal, obviously, it is greyish black in colour. It has a nice fragrance , nothing major. I applied for than a month or so . I apply the facepack on clean face. It dries with 10 mins. I wash the face after than on simple tap water. Well , skincare takes time. So you wouldn’t be able to see any change. With continuous use , it does help. It gives you a clear skin. At times, it did dry my face little bit (since I’m dry skin type , and this is clay ). I always have to use a heavy moisturizer after this pack. This will help you with evening out your tiny bumps or acne and pimple. However this didn’t brighten up my face instantly, as it claims . Neither did it add any glow. I think it’s a decent facepack for oily / combination skin girls. If you are dry , still acne prone , try this out. It won’t dry your face , yet work on acne / pimples. MRP: Rs 499 but it’s always ( 99% of the time ) on 33% discount on Nykaa i.e Rs 299 for 100g. Buy on Nykaa. Also, It is available on Amazon India. Yes ! It’s a decent facepack , nothing fancy or great. If you are oily /combination skin , do give this a try. Dry skin people can also give this a try. But I won’t recommend this to very dry skin people. Doesn’t add any glow to face. You have to mix the oil and facepack as it gets separated at times. Previous Garnier Wrinkle Lift Anti-Ageing Cream. Next Start Maker Eyeshadow Brushes – Review.